We’re not out of 2010 yet, and my first personal appearance of 2011 is already locked in! I’ll be attending Mark Millar’s incredible new Kapow Comic Con as one of the featured guests. The convention runs over the weekend of April 9th & 10th at the Business Design Centre in London. I’ll be there along with a host of comics, TV & film personalities, including (apart from Millar himself of course, and his Kickass co-collaborator John Romita Jnr) Dave Gibbons, Frank Quitely, Bryan Hitch, Paul Cornell, Noel Clarke and Brian Bolland. For full details of the Kapow Comic Con, check out the website here. Book early — this one’s set to be a sellout! Cybertron has become a dark, dangerous and lawless place, and gangs of Decepticons (emboldened by the resurgence of Megatron on Earth) now roam freely, openly, actively looking to re-open old wounds, enflame old hostilities. In sector zero, Dropshot encounters just one such gang, comprised of former Autobot Wheeljack, Skywarp and Thundercracker. Dropshot wants to go about his business, repairing a defective grid switch (part of a network that delivers refined energon across the planet), but Wheeljack and the others are intent on provoking him. Finally, Dropshot loses all pretense of diplomacy and engages weapons systems, ready for a fight. Wheeljack and the other Decepticons appear suddenly afraid… but not of Dropshot. Rising/forming behind Dropshot is the ghost-like Starscream, a deranged creature of pure energon! Dropshot is seized by Starscream and hoisted twitching into the air. Wheeljack, Skywarp and Thundercracker flee in abject terror. Finally, Starscream discards Dropshot (his body almost completely drained of energon). To Starscream’s unhinged mind, all Cybertronians are merely “fragments of the eternal flame” that he must extinguish & consume! In Avalon’s private chambers on Cybertron, the High Councillor communicates (via an interface console) with Alpha Quintesson. Avalon sees a way to remove the threat posed by Over-Run (to the coming ‘Inversion’) without raising any suspicion. He has divined a pattern of sorts in Starscream’s madness and believes that with suitable prompting/bait this ‘force of nature’ can be directed right to Over-Run’s door. Alpha Quintesson reports in turn that Unicron is now close to full reactivation, and that, as a consequence, their other rogue element (Optimus Prime) is running out of places to hide. Sure enough, deep within Unicron, Optimus Prime is fighting a desperate and losing battle against Unicron’s lethal internal defences. And for every bit of damage Prime does to the larger infrastructure, every sector or zone he ‘kills,’ thirty others come on line. The only way forward, Prime believes, is to somehow cut off the steady supply of energon that is rapidly restoring Unicron to operational/aware status. Earth: and Jetfire and Perceptor (combined Street Action Team) gauge the approach of Unicron, calculating 30 earth days until it reaches Cybertronian space. Jetfire wants all Mars base sensors trained on Unicron — as he hopes Prime will try and make contact. Perceptor conjectures that even if Prime is within Unicron (and they only have Megatron’s cryptic ‘belly of the beast’ message to go on) the chances of him being still alive are infinitesimal. But, above all else, Jetfire “believes” in Optimus Prime. 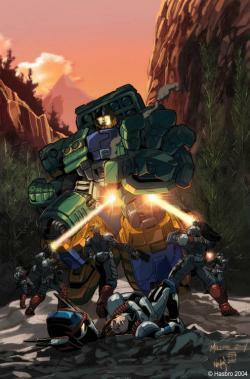 Earth: and in the desert Kicker is battling five airborne foes — using his energon powers to both defend himself and counterattack. Overconfident, Kicker is caught unawares by the unexpected versatility of his attackers and only just manages to deflect the final attack. It’s an AlterEnergy training exercise, overseen by Rad and Doctor Jones (Kicker’s father). Both are concerned that Kicker is not taking the threat to him seriously. Twice now he’s been actively targeted, and though both abduction attempts were thwarted they anticipate further attempts to capture him. They need to understand more about Kicker’s powers to know why the Terrorcons want him so badly, but Kicker is tired of jumping through their hoops and stalks off. Cybertron: Over-Run is deep in past events, and we see Alpha Quintesson urgently calling for something called ‘the Conduit’, but before it can be brought to him for safekeeping, it’s destroyed. As Alpha Quintesson’s escape ship is pulled back into Unicron, he just manages to teleport the Initiator to… someone. Back to Kicker, who decides it’s time he hit the road. He tries to flag down a passing heavy load carrier but suddenly it transforms and attacks. It’s Demolishor! 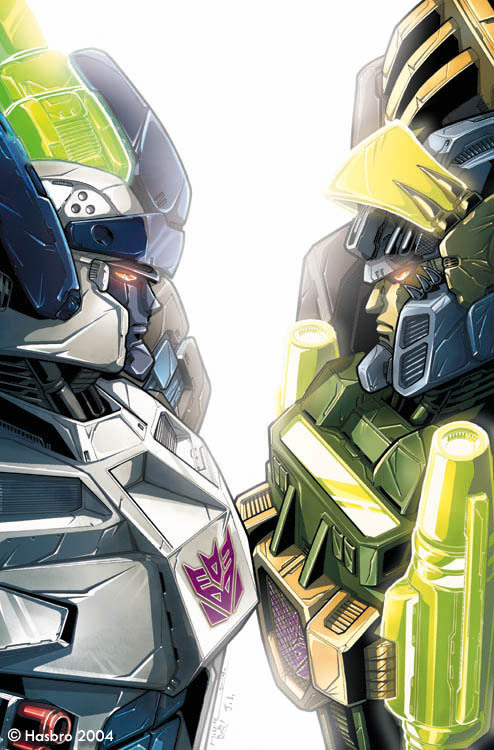 Finally, on Cybertron, Over-Run confesses a nagging fear that someone on Cybertron is a traitor, and the unseen listener is revealed as none other than Avalon — Autobot High Councillor and Alpha Quintesson’s secret collaborator!!! On Cybertron, Over-Run confides in an unseen listener. Hardwired into the planetary infrastructure/Hub Mainframe via the Mini-con Matrix, Over-Run has glimpsed the past and the future, a mute witness to Doomsday — times two! Over-Run recounts the destruction of Quintessa (though he doesn’t know the planet by name) by Unicron, thousands of years ago. And we see Alpha Quintesson, as was, scramble to save himself… and the future of the Quintesson race. He carries the Initiator (the device from #27). Over-Run can’t quite process the crush of imagery and information, but tells his solicitous listener he believes Cybertron was “seeded” and the harvest is now upon them. We cut to Alpha Quintesson (current). He instructs the recently upgraded (and promoted to Terrorcon commander-in-chief) Doom-Lock to continue the assault on Earth. Doom-Lock can’t see the point now the planetary shield is active, but Alpha Quintesson insists. From an unknown location, the Four Horsemen (Death, War, Famine & Pestilence) report that their work is done and they are returning to Unicron. But Alpha Quintesson insists they remain where they are. 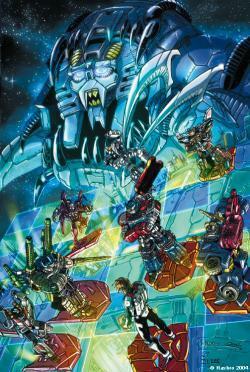 In response to their various objections, Alpha Quintesson counters that Megatron is “contained,” content to rebuild his Decepticon empire on Earth and Jetfire’s Autobots (without Optimus Prime) have little recourse to their ‘spark of combination’ and are forced to use artificial constructs (we glimpse Omega Supreme under construction). Unicron: planet-sized and planet-devouring bringer of chaos and destruction. Currently inactive. Megatron: deposed (and for 10 years officially dead) leader of the Decepticons. Currently in a new souped-up body and having just removed — permanently — current Terrorcon leader Scorponok. Avalon: a member of the current Autobot High Council on Cybertron, who possesses a mysterious technological artefact known as the Initiator. The full scope of his nefarious intentions remains cloaked in mystery. Over-Run: time-lost Mini-con currently hard-wired into Cybertron (via the Mini-con Matrix) and delving deep into the planet’s forgotten past. Starscream: former lieutenant of Megatron, thought destroyed, now existing in a strange non-corporeal (energon) form. Kicker: meta-human teenager, capable of storing, channelling and releasing energon through his biological systems. Mirage, Demolishor & Slugslinger: agents of Alpha Quintesson. The Four Horsemen of Unicron: Death, Famine, Pestilence & War, four former Autobots transformed into incredibly powerful agents of Unicron. Rad, Alexis & Carlos: human allies of the Autobots. Both Rad & Carlos work, in different capacities, for AlterEnergy, a company tapping the potential of energon as an alternative energy source. Okay, as much as possible, that brings you right up to speed. Check back here for the first chunk of #31’s outline soon! Signed Transformers goodies are up on ebay right now — and what’s better, it’s all in a good cause! Andrew Wildman’s Draw the World Together charity is auctioning off signed copies of Transformers collections All Fall Down and End of the Road (signed not just by the the two of us, but also inker Stephen Baskerville and colourist Nel Yomtov) and a host of other highly collectible items. For the full list of what’s up for grabs, click here and for all the details on Draw the World Together visit their website here. You are currently browsing the simon furman blog archives for November, 2010.